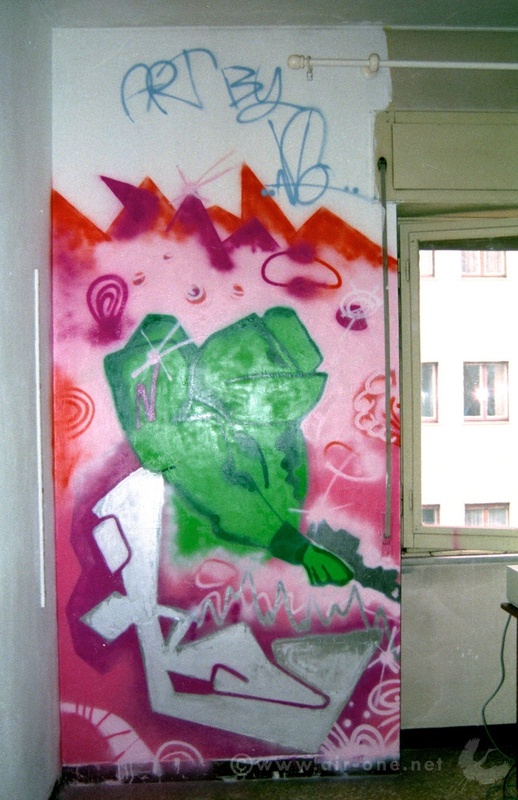 This is probably my 3rd piece, year 1989, but first one of many painted in friends’ rooms, something very intoxicating but really usefull to take your time and improve. The two pieces I painted in street before this one left me excited but definetly not satisfied. I had seen some fast hits by Atomo and Swarz really near my home and I knew it was possible to do better. But how? No books, no magazines, no internet… no one to ask. Almost impossible to get in touch with one of the few writers active in the city (10/15 people on 1.500.000 inhabitants). Colors I found were a deadly mixture of Talken and Very Well cans. The smell was terrible and they were harmful to inhale, they contained a gas that worked as solvent too, the european manufacturing laws changed few years later. Thanks Kappa, it’s been a great time.